Is it safe to walk on fire? The final test of Firewalking is to walk along the freshly raked ember carpet which is 600-700 °C burning hot. There are many theoretical discussions and scientific inquiries made as to how is it possible, that every person can take 4-5 steps intact with such extreme temperatures on ground. Unfortunately there are a lot of false ideas and superficial explanations circulating the internet about this confirmed human ability. Due to the uncontrollable expansion of the internet over the last 10 years, many superficial esoteric and semi-scientific explanations were formulated in the bad sense, which are usually written by people who hardly came in real contact with firewalking. Therefore it is our clear intention to publish on this site our own objective views on this matter. In the light of various scientific studies and based on our own accumulated experience, we would like to give an explanation why each person is capable of Firewalking. Human ethnologists believe that the ability of "fire immunity" is an evolutionary vestige that was a key to survival in the early stage of evolution. Escaping from the scrub and forest fires, the survival chances of the early cavemen greatly increased if he was able to maintain the condition, which modern firewalking researchers named "fire-immunity", for a short period of time. Human development was highly determined by its relationship with fire, and latest archaeological research has shown that one and a half million years ago, fire was used as a tool by the Australopithecus. The first anthropologist to study the phenomenon of immunity to fire was Laurens van der Post, who studied the !Kung (Bushman) groups of people in the Kalahari desert in Africa and published his observations in 1977. Later, Richard Katz, a Harvard psychologist, also examined this phenomenon. The !Kung practice firewalking as part of their healing ceremonies and according to the descriptions the dancers not only walk and dance on the coals, but also stick their heads into the burning coals as well as picking out embers with their hands rubbing the glowing embers on their naked body without getting burned or injured. 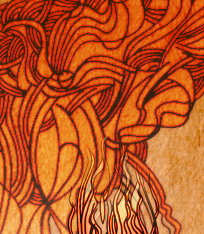 They say there is an inner fire - the n/um - dwelling in their body, and walking on the coals overheats this inner force, activating a healing power. They enter an altered states of consciousness called !Kia, which is a kind of trance. Thus, they are able to cleanse and heal not only the participants, but also the observers of the healing dance too. 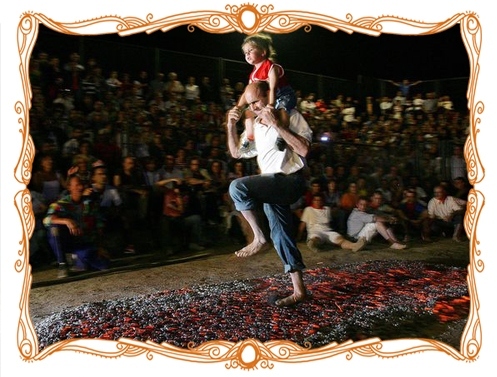 The first example geographically closer to us, is the example is the annual Midsummer Night's Firewalking of San Pedro Manrique in Spain, where the inhabitants of a village of 900 people, young and old cross the hot coal bed, usually carrying each other on their back. The huge ceremony is observed by thousands of viewers. 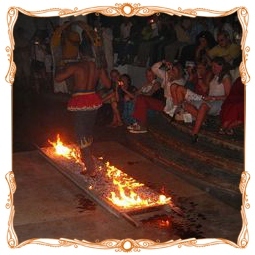 Locals claim that they know the Secret of Firewalking, and their feet resists the heat of glowing embers. And every year, the unsuspecting, adventurous strangers who try to imitate the locals, often leave with bandages lasting months on their feet, only to remember that the local fire immunity is part of the cultural upbringing and a result of a long mental preparation starting from their early age. The third well-known example is also from a place that is geographically closer to us. It is the so-called Anastenaria, a 3-day long holiday celebrated in the northern parts of Greece and Bulgaria, which ends with a ritual "firebed-dancing". It originally derived from an Orthodox Christian holiday from Kostri, which is celebrated twice in a year, in January and May in honor of St. Constantine and St. Helen. The faithful hold holy icons in their hands while dancing on the hot embers. According to their faith under the protection of the Saints the hot coals do not burn their feet. The dance will continue until the last hot coal ember is trampled. 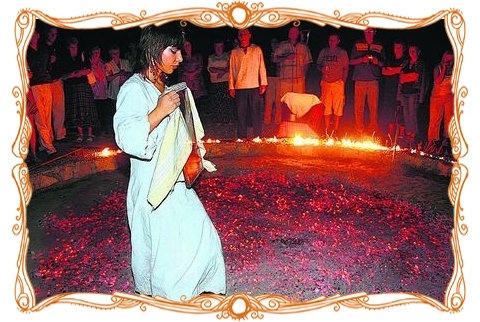 Various forms of Firewalking is practiced all over the world: in Bali, where young girls walk on hot coals, in India, Tibet, Sri Lanka, Japan, Argentina, and among the North American Indians too. 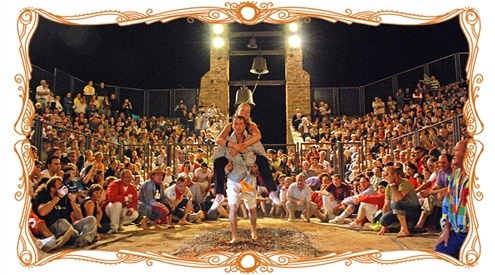 Skilled firewalkers will sooner or later all experience the phenomenon of "immunity to fire". We know and feel exactly when our mind switches to a different operating mode. I have my own experience to acknowledge the existence of this phenomenon. One way is to gather inner strength like the !Kung, to get ourselves into a kind of "raging" state of mind. So this altered mental state is briefly enough to maintain the natural integrity of a biochemical process providing immunity. This is sufficient to take about 4-5 steps. This time Fire is an "obstacle to overcome" appearing in a "figure of the enemy". Firewalking in this case is a kind of test of strength, mostly about whether I strong enough to cope with the embers. Another way is to think of Fire in completely different way: You don't have to beat the fire as an enemy, it does not appear in our mind as an obstacle, but as someone who is personified as an inviting host calling the firewalker to feel free to come in, there's nothing to be afraid of. In such state of mind, walkers feel the coal soft, silky and nicely warm, definitely feeling comfortable about it. The number of steps that can be done this way is about 7-9. In 2000 at the turn of the Millennium, a certified 50.29 meter long Guiness World Record was set by Gary Shawkey from the U.S. on a coal bed made up of embers with an average of 982.22 °C. Since then this record has been repeatedly overthrown. It is foolish to think that the Firewalking is some kind of competition or test for its own sake. 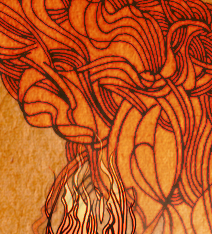 The experience of fire-immunity does not depend on the length of the ember carpet. Why is it safe and when is it safe? 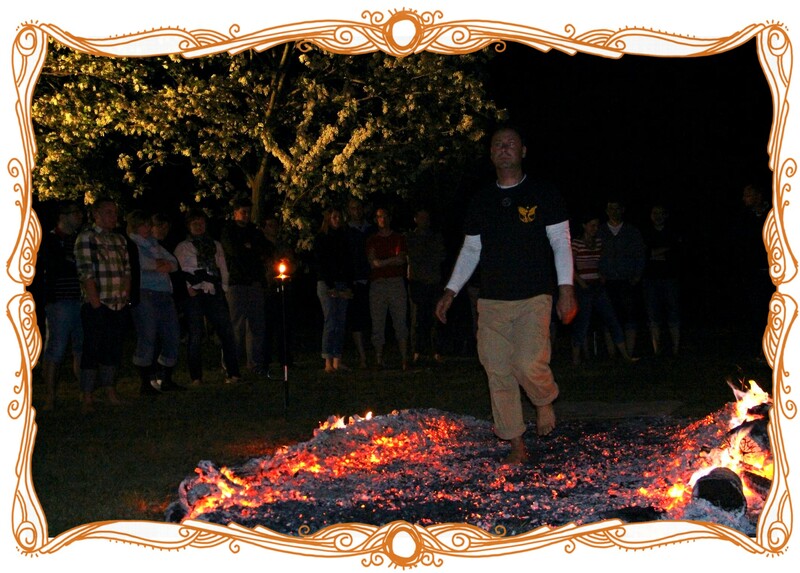 Firewalking can only be performed with a clean and sober head; alcoholic influence proved to make it impossible to walk safely. It decreases mental focus and destroys concentration. Therefore, we strictly prohibit alcohol consumption for all participants before Firewalking. All our experience shows that everyone has the natural ability to securely walk on fire, but only with a clear head and the crucial capability of making clear decisions. Everyone needs a kind of inner conviction and a sense of security. Firewalking is a common human ability that is latently present and hidden in everyone, but the ability we call fire-immunity, which is a mental state, is only "activated" if you mentally accept its existence and let it come into operation spontaneously. All kinds of volitional control, intended on-off switch only makes matters worse. The human mind is able to operate this self-defense mechanism spontaneously, if left uncontrolled. Some of this inner reality, proper mental reality tuned to the creation of the Firewalking most important part of the program, which is led by a number of preparatory practices for! Firewalking is why the "home" is not recommended! The right mental attunement absence will almost certainly end in a bad experience! For those who just want to willingly walk on fire and leave no time to mind "tune" the fire, serious injury to expose themselves. The fire does not lie, deceive ourselves in this situation can not be. Our body is a bio-feedback system, which immediately tells you if a decision is premature. Circulating on the Internet in many erroneous belief that the Firewalkingt 12 hours prior to solid food can not be ourselves, because this reduces the chances of developing immunity to fire. With the number of bustards group shared experience that no such direct relationship or connection is not. Belly up to the past to reduce the ability to concentrate. Ennek a belső bizonyosságnak, a megfelelő mentális hangoltságnak a megteremtése a Tűzönjárás program legfontosabb része, amit az általunk vezetett számos előkészítő gyakorlat szolgál! Éppen ezért a Tűzönjárás "házilag" nagyon nem ajánlott! A megfelelő mentális ráhangolódás hiányában szinte bizonyosan rossz tapasztalattal végződhet! Azok akik csak akaratból akarnak tűzönjárni, és nem hagynak időt, hogy elméjük "ráhangolódjon" a tűzre, komoly sérülés veszélyének teszik ki magukat. A tűz nem hazudik, magunkat becsapni ebben a helyzetben nem lehet. Testünk olyan bio-feedback rendszer, ami azonnal tudatja velünk, ha döntésünk elhamarkodott. Számos téves hiedelem kering az interneten arról, hogy a Tűzönjárást megelőző 12 órában nem lehet szilárd táplálékot magunkhoz venni, mert ez rontja a tűz-immunitás kialakulásának esélyét. Számos Tűzönjáró csoporttal közös tapasztalatom, hogy semmiféle ilyen közvetlen összefüggés vagy kapcsolat nincs. Az eltelt has legfeljebb a koncentrációs képességet csökkenti. Is there a chance of injury? Those people, who rush into the fresh coal bed might get a slight burn. These are typically small, superficial red "hot-spots", which usually disappear by the next day. Those who fear into the coals and a half ahead of megégéstől, waiting for what he gets. My self-limiting beliefs do not allow your body to protect itself automatically. In this case, the sole water blisters the size of a small nail, mild first-degree burns. They will often stretch back the next day, but no more than 1-2 days and then disappear hurt or burst. Below them, the new skin can be sensitive, but they are not serious injuries. Very rarely, but sometimes, someone enters the inadvertent branded carpet edge accumulated in deeper (and hotter) brands. If this causes a sudden fright, and thus the collected status is lost, the parázsonjáró "megkapathatja 'legs. In this case, larger contiguous felüleleten formed blisters, which can really hurt a few hours. The next day, they also subsided, but healing as 1-2 weeks. This would only occur in the careless Jaro. If the fire-immunity exists, and there is no fright, the glowing depth, but do not expect anything. (See the video demonstrating the example from India.) Fortunately, this very rarely happens! 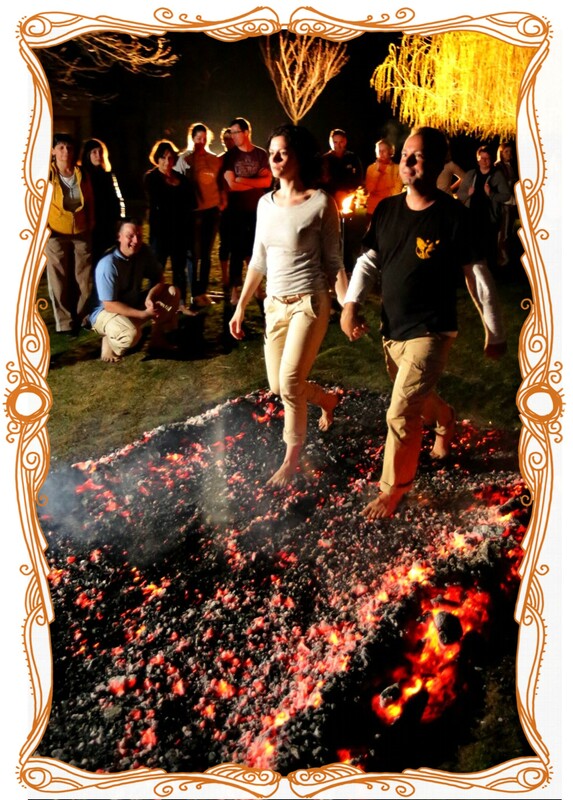 Our experience is that 99% of Firewalking participants who take the training seriously, do not suffer any injuries while walking on hot coals and do not feel any extreme heat at all! Don't forget to check out our REFERENCES! Aki elhamarkodottan lép a parázsba, szerezhet enyhe égési sérüléseket. Ezek leggyakrabban apró, felszínes vörös pöttyökként (hot-spots) jelentkeznek, amik másnapra eltűnek. Aki félelemmel lép a parázsra és előre fél a megégéstől, meg is kapja amit vár. Saját önkorlátozó hiedelmei nem teszik lehetővé, hogy teste automatikusan megvédje magát. Ilyenkor a talpon kisköröm nagyságú vízhólyagok keletkeznek, enyhe első-fokú égési sérülést szenvedhet. Ezek gyakran másnapra vissza is húzódnak, de legfeljebb 1-2 napig fájnak utána eltűnnek, vagy kipukkadnak. Alattuk az új bőr lehet érzékeny, de ezek nem komoly sérülések. Nagyon ritkán, de előfordulhat, hogy valaki óvatlanságból belelép a parázsszőnyeg szélén felhalmozott mélyebb (és forróbb) parázsba. Ha ez hirtelen ijedséget okoz, és ezáltal az összeszedett állapot megszakad, a parázsonjáró "megkapathatja" a lábát. Ilyenkor nagyobb felüleleten keletkezik egybefüggő vízhólyag, ami pár óráig nagyon tud fájni. Másnapra ezek is lelohadnak, de gyógyulásuk akár 1-2 hét is lehet. Ilyen csak az óvatlan járóval fordul elő. Ha a tűz-immunitás fennáll, és nincs ijedség, akkor a parázs mélysége semmit-de semmit nem számít. (lásd a fentebbi indiai példát bemutató videót) Szerencsére ilyen nagyon ritkán fordul elő! A tapasztalatunk az, hogy a felkészítésünket komolyan vevő Tűzönjárók 99%-a semmiféle sérülést nem szenved, a parázson járva, semmilyen extrém hőhatást nem érez! "In this case there is no fraud or trickery. A Firewalkingt for centuries practiced worldwide. Lot of people have to believe that paranormal phenomena. As a study in 1930 from the University of London physicists two Firewalkingt also organized. Further study in 1935, 1937 - was conducted in a spectacular Firewalkingsal bound together. Studies have found that the Firewalkingnak nothing to do with faith or supernatural forces. This phenomenon is based on the burning wood sight scary, but the wood thermal conductivity is low, the feet and the coals between exposure time short enough to prevent the formation of base burns. The temperature range in three ways, convection, radiation and conduction. Convection, the heat spreads the material during the movement, for example, hot steam, hot water or a hot gas stream. All bodies emit electromagnetic radiation, which is dependent on the temperature of the body. This can be felt around the open fire. The third heat propagation mode of driving, which is the atomic constituents of material associated with the movement. If we put a pot on the stove and warm, the ear can only hold if it is not made of metal. The heat of the material is more or less kept the better metals and other materials, for example. wood, plastics or less. The Firewalkingnál hőterjedésnek of this third form of the thermal conductivity is important. The hot coals molecules, atoms rapid, irregular movement on the embers entering the plantar skin of the atoms move more slowly, however. The parázsból flowing into the base of the exposure time is proportional to the amount of energy - the power drive around - but the proportionality factor in the conductivity. The charred embers of poor thermal conductivity of the skin as well. In addition, certain parts of the foot during walking alternately in contact with the hot embers, and uneven surface of the coals, so the base and a point just short of the brand of contact. The base is lit, it damage occurs when the skin temperature is above a certain threshold. The skin temperature of the hand parázsból our sole of the foot and under the brand contact heat flow determined by the amount. The question arises, what happens if we bevizezzük the foot. 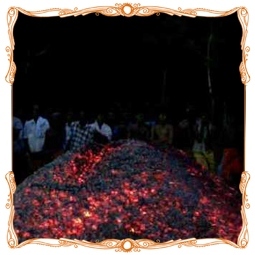 The water absorbs some of the energy, it absorbs heat through evaporation, but the vapor can cause dangerous burns, it experienced a fire in attending their feet wet for the first time, but before the coals were entering, dry cloth. It is reported that uplifting feeling of Firewalking, improves self-confidence, despite the fact that there is nothing supernatural in it. " "The hot lead did not burn the skin, because they are not directly affected. Something happens, like a hot iron plate drop of water falls. In this case, a drop in direct contact with the iron plate as below immediately gőzréteg formed, and it protects the high temperature influences . Physicists have long been aware of this effect and called Leidenfrost's phenomenon. The hot lead or the glowing embers also create gőzréteget wet hands or soles of encountering this gőzréteg protect your skin. " We végszavával Michael Makai, that there is nothing supernatural in Firewalkingban agree. But the explanation is not low thermal conductivity of the coals, and not even the Leidenfrost's phenomenon should be sought. We used to have embers and dancing feet dry and wet, hot and cold feet in winter and summer, at 12 degrees below zero ° C and +30 ° C in a warm climate. In contrast to popular belief, skeptical, Firewalking, the chip is not simply a matter of physics. The Commissioner also alleged by Michael Makai scientific paradigm was the Discovery Channel's popular science and educational program of the series one episode of Myth-Busters: Adam tries Firewalking. The film demonstrates the physics show that despite the burns practically impossible, if one is constantly on the move, Adam Savage well burn your feet. In our opinion, not because they do not know the techniques of safe districts, but because they simply do not "believe" in the possibility of integrity. I do not have time to develop the inner conviction that the Firewalking safely possible. Others involve security because the coals, because the framework of scientific paradigms can create a belief system that is ready to believe in the integrity of the light. In our experience, it is all the same to the appropriate mental tuned confusion, their internal beliefs, scientific paradigms of physics, or some sort of spiritual belief birthday. What any serious scientific study demonstrated is that if one party parázsonjárástól, burned. For some reason, the very laws of physics are not sufficient for safe walking, as in the above case of Adam Savage. We believe in us, and going more than 700 people, proved by experience, that the fire-immunity is not some "walking technique" question, but a very specific mental hangoltság question. Mastery over the mind, or even elengedettség function. Preparation and practices for precisely tunes aim to create, come into the mental hangoltság, which is essential for safe Firewalking! The information contained herein are based on the personal experiences of Bence Laszlo Tarr, FIT certified firewalking trainer. Firewalking for inexperienced person with no preparation can be dangerous! Do not try it alone, in the absence of proper training! "Ez esetben nincs semmi csalás vagy szemfényvesztés. A Firewalkingt évezredek óta gyakorolják világszerte. Sokan megvannak győződve arról, hogy paranormális jelenségről van szó. Ennek tanulmányozására 1930-ban a University of London fizikusai két Firewalkingt is szerveztek. További tanulmányokat 1935-ben, 1937-ben végeztek, látványos Firewalkingsal egybekötve. A vizsgálatok azt állapították meg, hogy a Firewalkingnak nincs köze a hithez vagy a természetfeletti erőkhöz. A jelenség arra épül, hogy az égő fa látványa félelmetes ugyan, de a fa hővezető képessége alacsony, a lábak és a parázs közti érintkezés ideje kellően rövid ahhoz, hogy megakadályozza égési sérülés kialakulását a talpon. A hő három módon terjedhet, konvekcióval, sugárzással és vezetéssel. Konvekció esetén a hő az anyag mozgása során terjed, például a forró gőz, a meleg víz vagy forró gázok áramlás során. Minden test bocsát ki elektromágneses sugárzást, ami a test hőmérsékletétől függ. Ezt érezni lehet a nyílt tűz közelében. A hő harmadik terjedési módja a vezetés, ami az anyag atomi összetevőinak mozgásával kapcsolatos. Ha felteszünk a tűzhelyre egy edényt, és az felforrósodott, a fülét csak akkor lehet megfogni, ha nem fémből van. A hőt az anyagok többé-kevésbé vezetik, a fémek jobban, más anyagok, pl. a fa, a műanyagok kevésbé. A Firewalkingnál a hőterjedésnek ez a harmadik formája, a hővezetés a fontos. A forró parázs molekulái, atomjai gyors, rendezetlen mozgást végeznek, a parázsra lépő talp bőrének atomjai viszont lassabban mozognak. A parázsból a talpba áramló energia mennyisége az érintkezés idejével arányos - a vezetés közelhatás -, de az arányossági tényező a vezetőképesség. A parázs elszenesedett része rossz hővezető, a bőr szintén. Ráadásul járás közben a talp egyes részei felváltva érintkeznek a forró parázzsal, továbbá a parázs felülete egyenetlen, ezért a talp egy adott pontja és a parázs között csak rövid idejű az érintkezés. A talp akkor ég meg, akkor keletkezik sérülés, ha a bőr hőmérséklete meghalad egy bizonyos küszöbértéket. A bőr hőmérsékletét viszont a parázsból a lábunkba a talp és a parázs érintkezése alatt áramló hő mennyisége határozza meg. Felmerül a kérdés, mi történik, ha bevizezzük a talpunkat. A víz elnyeli az energia egy részét, mert párolgása révén hőt nyel el, de a keletkező gőz veszélyes sérülést okozhat, ezért tapasztalt tűzönjárók először bevizezik a talpukat, de mielőtt a parázsra lépnének, szárazra törlik. A beszámolók szerint felemelő érzés a Tűzönjárás, jelentősen javítja az önbizalmat, annak ellenére, hogy semmi természetfölötti nincs benne." "A forró ólom azért nem égeti meg a bőrt, mert közvetlenül nem érinti. Olyasmi történik, mint amikor egy izzó vaslapra vízcsepp hull. Ilyenkor a csepp nem kerül közvetlen érintkezésbe a vaslappal, mert alatta azonnal gőzréteg képződik, és ez megvédi a magas hőmérséklet hatásától. A fizikusok már régen ismerik ezt az effektust, és Leidenfrost-féle jelenségnek nevezik. A forró ólom vagy az izzó parázs ugyancsak gőzréteget hoz létre a nedves talppal vagy kézzel találkozva, ez a gőzréteg védi meg a bőrt." Mi Makai Mihály végszavával, miszerint a Tűzönjárásban nincs semmi természetfeletti egyetértünk. Viszont a magyarázatot nem a parázs rossz hővezető képességében, és mégcsak nem is a Leidenfrost-féle jelenségben kell keresni. Jártunk és táncoltunk már parázson száraz és nedves lábbal, hideg és meleg lábbal, télen és nyáron, -12°C fokos hidegben, és +30°C-os melegben is. 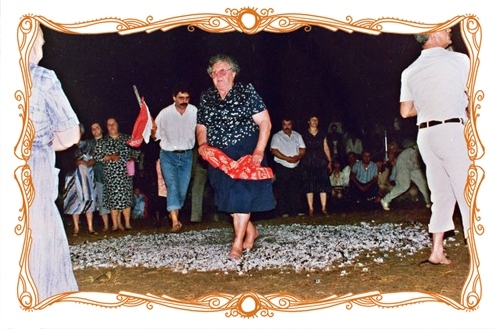 A szkeptikus közhiedelmekkel szemben, a sértetlen Firewalking nem egyszerűen fizika kérdése. A Makai Mihály által is biztosnak vélt tudományos paradigmát vizsgálta a Discovery Channel népszerű tudományos-ismeretterjesztő műsora a Myth-Busters sorozat egyik epizódja. Az Adam tries Firewalking . A film tanulsága szerint hiába bizonyítja a fizika, hogy a megégés gyakorlatilag lehetetlen, ha az ember folyamatosan mozgásban van, Adam Savage jól megégeti a lábát. Véleményünk szerint nem azért, mert nem ismeri a biztonságos járás technikáját, hanem mert egyszerűen nem "hisz" a sértetlenség lehetőségében. Nincs ideje kialakítani azt a belső meggyőződést, hogy a Firewalking biztonsággal lehetséges. Társai azért járnak biztonsággal a parázson, mert a tudományos paradigmák keretrendszerén belül képesek kialakítani egy olyan hiedelemrendszert, amely tükrében készek hinni a sértetlenségben. Tapasztalatunk szerint teljesen mindegy, hogy a megfelelő mentális hangoltságot, a szükséges belső meggyőződést, a fizika tudományos paradigmái, vagy valamiféle spirituális meggyőződés szüli. Amit minden komolyabb tudományos vizsgálat igazolt az az, hogyha valaki fél a parázsonjárástól, megégeti magát. Valamiért a puszta fizika törvényei mégsem elegendők a biztonságos járáshoz, mint a fenti Adam Savage esetében. Meggyőződésünk és a velünk járó több, mint 700 ember által bizonyított tapasztalatunk, hogy a tűz-immunitás nem holmi "járás-technika" kérdése, hanem nagyon is mentális hangoltság kérdése. Az elme feletti uralom, vagy éppenséggel elengedettség függvénye. Előkészítő és ráhangoló gyakorlataink pontosan azt célozzák, hogy létre-jöhessen az a mentális hangoltság, ami a biztonságos Tűzönjáráshoz elengedhetetlenül szükséges!